After Madeline Stuart, teen model with Down syndrome who successfully stepped in the New York Fashion Week (NYFW), this time turn Rebekah Marine, a 28-year-old model with disabilities who was born without a right arm. As quoted from Mashable on Wednesday, September 2, 2015, Rebekah will walk at the New York Fashion Week on next September 13, in the event of FTL Moda. For Rebekah, to become a professional model and was finally able to walk on the run way as NYFW is a struggle. When she was young, not a few people who said that he would not have a future in the world of modeling. "For persons with disabilities, to reach the dream became a model very difficult in recent years. Agents will not even see my portfolio. But I realized, it's all about self-discovery," said Rebekah to Mashable. Rebekah adding that most of her clients do not want to cooperate with her, simply because her arms were not perfect. 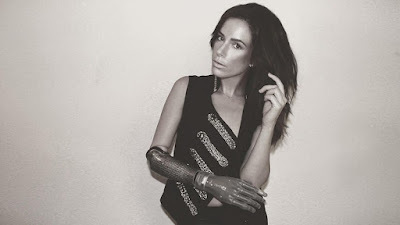 But all that changed four years ago, when she decided to install an artificial hand on her right arm. It was made with the hand gesture control technology, or generally-called bionic arm. Rebekah has now been joined by the other disabilities models, such as Madeline Stuart, a model with Down syndrome who has been pacing the FTL Moda catwalk.